It is thought that these fun candies were invented sometime in the 1920′s; but no one knows by whom. Anyway, they are fun to make and more fun to eat! 1/2 cup (4 oz.) heavy cream, at room temp. 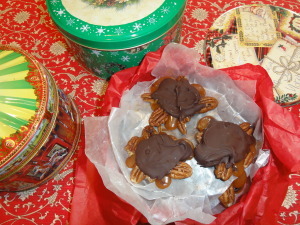 On a slightly oiled smooth surface, such as marble or plastic, place clusters of 5 or 6 pecans. To make the caramel cook the sugar with a spash of water and the corn syrup over gentle heat until the sugar is completely dissolved. Increase the heat, and boil, without stirring, until a caramel (golden) color is reached. Stir in the butter and when it is almost melted add the cream. Continue boiling, stirring occasionally, and insert a candy thermometer. When the temperature reaches 254 degrees, remove from heat and stir until it stops boiling. Place tablespoonful of this mixture on the pecan clusters. Let cool.